The above was part of information given to us by one of Jerey’s favorite teachers during an Individualized Education Program (IEP) meeting a few years back. Jeremy is older now, but like all parents my husband and I worry about what his future will look like. Jeremy is now 22 years old, and with the economic situation being what it is, we are doubly concerned about the financial aspects of Jeremy’s life as an adult. But as the saying goes, worry gets you nowhere – fast. Preparing, planning and creative thinking is a better alternative to wringing our hands. When thinking about employment for your child or student on the spectrum, there are a few aspects that need to be focused on: the life skills he or she needs to learn; a clear understanding of what employers look for in an employee; the interests and strengths of the person on the spectrum; the usefulness of mentors; and the different employment structures currently available. In this post, I’ll be discussing necessary life skills and what employers look for. In my book, Autism Life Skills : From Communication and Safety to Self-Esteem and More – 10 Essential Abilities Every Child Needs and Deserves to Learn, the ten skill areas covered are important for all aspects of life, whether at work, at school, at home, or in the community. Some of the skills such as self-regulation, independence, social relationships, and self-advocacy are important for getting and keeping a job. The topic of earning a living is the last chapter in my book, because being able to get and hold a job is really a culmination of all the life skills hopefully learned during the school -age years, whether a person is on or off the spectrum. For example, for someone to be accepted in a workplace, he must be able to control his emotional and sensory meltdowns. A certain amount of independence is needed at most jobs. Understanding that you should speak to your boss differently than you would to a colleague is important to know in most work situations. Self advocacy skills are necessary in order to request what you need to get the job done. Now, many of you reading this are probably focusing on the skills in this list your child or student does not have. Look at it again, and think about what attributes your child does have. For example, most people on the spectrum are honest to a fault – they are usually the ones in the store saying “yes” when a woman trying on a dress says “Does this make me look fat?” They are not the employees who will be caught with thier hands in the cash tills. That’s a positive point to sell. A strong work ethic applies to most of our guys – the ones who do not like a change in routine and are going to be there rain or shine. They will not be calling in sick because they had one too many martinis the night before, or leave early because they have an event to attend. Analytical skills are really ‘obsessive attention to detail,’ and many of our children have that. The child who likes to line up blocks and trains probably has good organizational skills. Teamwork and flexibility are difficult areas for many, but we should be teaching flexibility at school (there are ways of doing that), and teamwork can be handled by ensuring the person on the spectrum has one person on the team that he is in contact with for all needed information. Many of our children with Asperger’s are good communicators, and some have become journalists, speechwriters and professors. The point is, when people are selling a product and/ or service, they market the positive attributes, not the negatives. And that’s precisely what we need to be doing with any prospective employee on the spectrum. In my next post, I’ll discuss the interests and strengths of the person on the spectrum, and the usefulness of mentors. [i] This quote is as meaningful today, as it was given over 40 years ago by Dr. Robert Kraskin during a seminar given to Developmental Optometrists who were concerned with the mismatch between the physiological preparedness of young children, the cultural demands imposed upon them. awareness and thus allows for abstract cognitive thought and imagery to flourish without any obligation to act as a sentinel for spatial security. Join us for a free Q & A with author and parent Ann Palmer on Thursday, November 17 from 6:00 to 8:00 PST. (Sign up for our newsletter to register and we’ll send you information about how to ask questions in the newsletter). Celebrating holidays together is a way that families stay connected and feel supported. Families living with ASD especially need the support and understanding of their extended family members. But family get-togethers, holiday gatherings, or large social events are typically very stressful for a family with a child with ASD. Ms. Palmer will discuss why these events may be difficult and what family members and friends can do to show their support and make the holidays easier for the child with ASD and the parents. 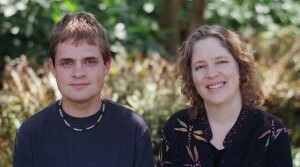 Ann Palmer is the parent of a 28 year old son with autism and has worked in the field for the last 20 years. She was the Parent Support Coordinator for Division TEACCH and the Director of Advocacy and Chapter Support for the Autism Society of North Carolina. She is currently a faculty member of the Carolina Institute on Developmental Disabilities at the University of North Carolina in Chapel Hill. Ann is the author of three books published by Jessica Kingsley Publishers. Realizing the College Dream with Autism or Asperger Syndrome: A Parent’s Guide to Student Success was written about her son’s experience at a large state university. Parenting Across the Autism Spectrum: Unexpected Lessons We Have Learned was co-authored with Maureen Morrell and is an excellent resource for parents and family members of newly diagnosed children. Her newest book, A Friend’s and Relative’s Guide to Supporting the Family with Autism: How Can I Help? will be released in June 2012. This post was originally published on my Huffington Post blog. Recently one of my publishers sent me a book, Following Ezra: What One Father Learned About Gumby, Otters, Autism, and Love from His Extraordinary Son. Having just emerged from many months of researching and writing book number five on autism, I was not predisposed to read anything associated with the A-word. However, being partial to interesting book covers, I couldn’t resist the urge to peruse this memoir. Once I opened it, I couldn’t put it down. 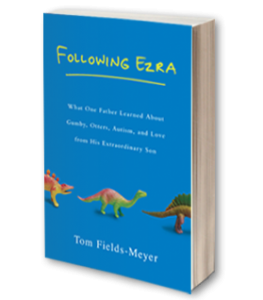 Following Ezra by author Tom Fields-Meyer, is not just a book about raising a child with autism; it’s a very well-written book about the trials and tribulations of being a parent, period. One reason this book is such a good read is that covering human interest stories is what Fields-Meyer does for a living. He is a former senior writer for People and has written for the New York Times and the Wall Street Journal. He is a master storyteller, and this time he recounts his own personal story and that of his son, Ezra, from age 3, when he was diagnosed, to his bar mitzvah at age 13. Another reason is the approach that Fields-Meyer decided to take in raising his son with autism, who didn’t like to play with children when he was little, obsessively lined up plastic dinosaurs, and avoided eye-contact. In the prologue of Following Ezra, Fields-Meyer describes his quest of searching for the right doctors, diets, medicines and therapies. But what he discovers is that he has been focusing on the wrong thing: “It wasn’t about finding the right expert for my child; it was about learning to be the right parent,” he writes. As Fields-Meyer explains, many parents in this situation are in mourning for the child they expected and hoped to have, and they have to go through a mourning process so that they can move on, as the therapist rightly pointed out. Only, he didn’t feel that way, because he hadn’t had any expectations about the child he was hoping to have. Over the years he’d seen acquaintances who wanted their children to go into the family business or become lawyers, or who didn’t want them to be gay. These parents were disappointed in their children when they didn’t turn out the way they expected. Fields-Meyer never wanted to be that kind of parent. Most parents of children with regressive-type autism (children who developed normally and then lost the skills they had gained) would understandably have a different outlook. In those cases, parents mourn for the child they did have, the child that was interacting with them, that they saw change before their eyes. That’s a different situation. I have met many parents of children like mine, who showed signs of having significant developmental challenges from early on, and many of them mourn the child they wish they’d had, while accepting the child they do have. Personally, I relate to the author’s point of view. Raising Jeremy, who still requires 24/7 care at age 22, is exhausting and not without struggle. But whenever I read the news of the day, I am grateful that my son will never be maimed in war, become a serial killer or turn out to be a stockbroker on Wall Street who bilks trusting clients out of millions of dollars. It’s clear that it is not always easy for Ezra to be Ezra, or for Fields-Meyer to be the parent of Ezra, and Fields-Meyer does not gloss over the challenges and weariness. He may not mourn for the child he did not get, but he certainly does not consider having Ezra as being a special blessing or a miracle. Parents will recognize the painful situations that many of us share: the haircuts where Ezra feels so tortured he grabs the scissors and throws them at the hairdresser; the times that Ezra runs out of the house clad only in his underwear; or clothes shopping expedition when Ezra licks his image in the mirror and then puts the shirt on — backwards. Raising a child who has obsessive thoughts and who verbalizes them constantly can be truly exhausting. 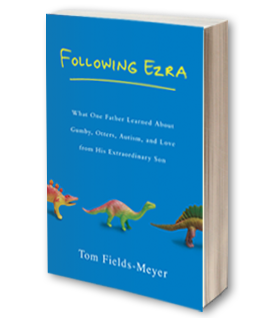 Fields-Meyer describes how, a few weeks before Ezra’s bar mitzvah, he helped Ezra put aside his obsessive thoughts about the Complete Star Wars Encyclopedia and gift cards he hopes to receive. Fields-Meyer takes him for a walk and listens to Ezra explain the mental jam he is in. Fields-Meyer instructs him to take all his thoughts about the coveted presents, put them all in a black lump in his head, pull the black lump out of his head through his ear, and leave the lump under a tree. He instructs him that if he has more obsessive thoughts before the bar mitzvah, he should send them there. This seems to work. We have a custom in our family. When somebody breaks a glass, we celebrate. As soon as you hear the shards shattering on the kitchen floor, the rule is that you say: “I hated that glass! Thanks for getting rid of it for me!” Because what else can you do? Get angry? Make the person pay the price? It’s not going to bring the glass back. So we make the best of what we have, and we always try to make life a celebration. And then we clean up the glass. Ezra is now 15, and Fields-Meyer has helped him find a way to channel his interests and obsessions through the use of technology to give him an outlet to express himself, and perhaps to have a future career. Next month, Ezra will be the published co-author of a children’s book E-MERGENCY with New York Times bestseller Tom Lichtenheld, based on an animation Ezra made when he was 12. I’m looking forward to reading it. The book cover is pretty cool.